"Hey, my Warehouse 23 order is here! What's this inside? Looks like a tentacle . . ."
That's right! 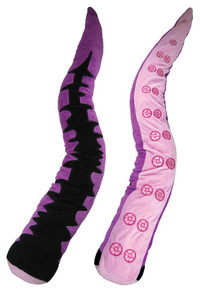 When you order $75 (or more, of course, and shipping doesn't count) worth of games and other assorted awesome stuff via Warehouse 23 during the month of October 2013, you get the most indescribable of plush bonus surprises: a free Plush Purple Tentacle! Once you're done gibbering, you can use this tentacle to adorn your hand or head, you can place it in strange places for others to find, or you can keep the madness at bay by cuddling with it at night. But don't say we didn't warn you!